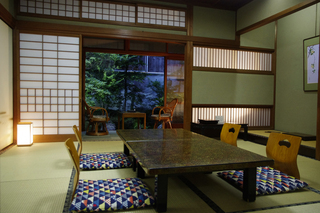 -Located in the middle of Kinosaki, wooden 3 story structure with traditional Japanese tea-ceremony arbors. 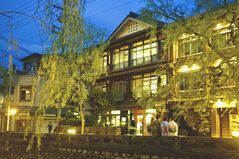 -The inn compliments the scenes of the weeping willow lined Otani River that runs along side it. From the four guest rooms located on the Otani River side of the building guests can watch yukata(cotton kimono) clad pedestrians walk along the tree lined river streets on their way to the open-air public baths. -Colorful yukata (cotton kimono) rental available for both men and women, JPY 500 per yukata. -Guests can also order a cake from the inn for special occasions, orders must be made at least 24 hours in advance. 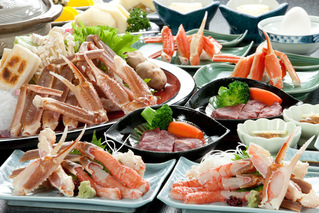 Most popular course year round, fresh seafood served on a boat platter. Also comes with Tajima beef (a.k.a. Kobe beef), a little bit fancy. At the end of this meal mix your rice into the broth for a unique dish, rice soup! 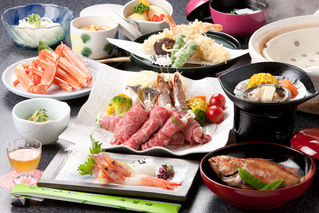 The most popular and simple plan, comes with crab and Tajima beef (a.k.a. 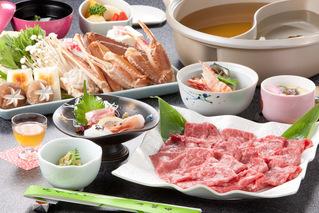 Kobe beef) for a culinary delight. From November the long awaited crab season finally opens! The bath is open from 3:00p.m. to 9:00a.m. the next morning. This lets guests enjoy the bath all night long. The women's bath and family (private) bath are interchangeable, please be aware of the changes between 3:00p.m. and 9:30p.m. Shower cap, conditioner, shampoo, hairdryer and shaver are located in the large public bath. A hairdryer can be borrowed at the front desk and taken back to your room. Need help finding your way around Kinosaki? 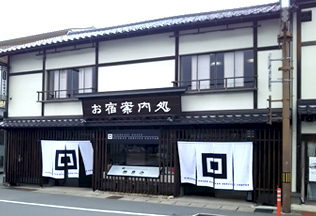 We are located right in front of the Kinosaki train station, across the street. Between the bank and restaurant. *Business hours 9am to 6pm. We suggest printing out a copy of this window and bringing it with you. This will help you find your inn once you arrive in Kinosaki. *Times are limited, please check the train times at the station in advance.